Trump showed a before-and-after map to reporters to demonstrate the extent of jihadist losses during his presidency. He has said several times in recent weeks that Islamic State had lost all its land even though fierce battles persisted. 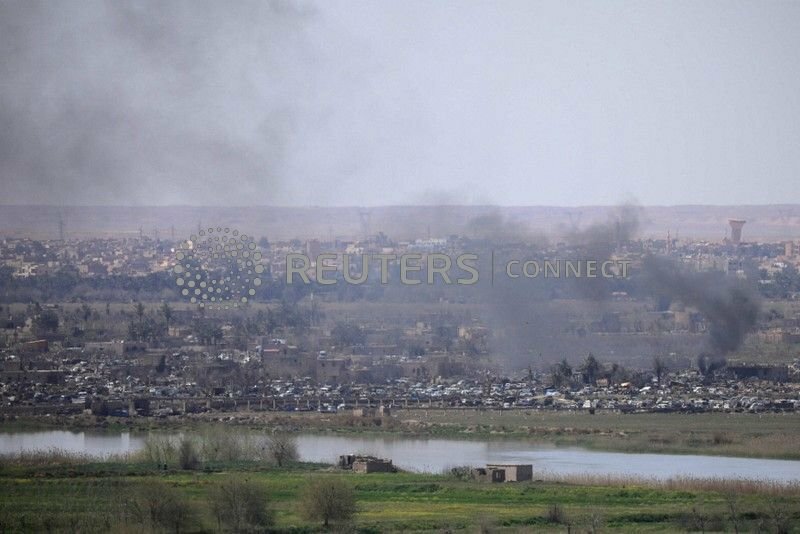 The SDF has been battling for weeks to defeat Islamic State in Baghouz on the Euphrates riverside at the Iraqi border. This week it announced it had captured a jihadist encampment that represented most of the remaining enclave. Even before a world audience the trump administration keeps up the misinformation and BS. However, progress has been made in eroding the capability of IS. There are an estimated 20K IS fighters still in the region, some of whom have already commenced guerilla warfare in Iraq. So what's next in addition to the destruction of IS in Afghanistan, Philippines and Africa and capture of it's leaders? For those interested David Kilcullen is IMO an excellent analyst concerning counter terrorism who has published a number of essays related to IS. Thank God none of the American troops in the field apparently suffered from any bone spurs. “You﻿ guys can have the map. Congratulations," Trump said. "I think it's about time." The president has previously displaye﻿d a map illustrating the diminution of Islamic State. Although he said the "before" map showed Islamic State's presence at his election in 2016, the version given to reporters showed it was da﻿ted 2014, when the group's territorial control was at its peak. U.S.-backed forces in Syria and Iraq captured extensive stre﻿tches of that territory before Trump's election. Occasionally each of us need to reflect on our opinions.... this might be one such I nstance. For me, reflection has changed my opinion on commander bonespurs somewhat... As in... thank goodness he was too chicken pooped to serve. Too bad America again fought and died and got no land in return. I'm tired of costing the USA so much and getting nothing in return. If B.S. was tar seal the guy would pave a four lane highway to the Moon and back. And he really does think he is going forward by patting himself on the back. By now, Kim Jong Un must have a scrapbook book full of cartoons of Trump to laugh over.